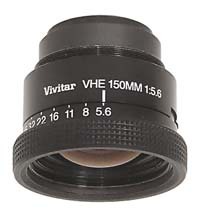 High quality Vivitar VHE 150mm enlarger lens, a recommended focal length for 4"x 5" negatives. These lenses have a f/5.6 maximum aperture, knurled rubber aperture ring, click stops on each half stop, and a click stop override feature. Supplied with front and rear lens caps. Made in Germany for Vivitar by Schneider.